The Activated Bio-Sand (ABS) Water Filter was conceived by Mervyn A Fernando, Gokul Prakash C and Loganathan S of the Civil Engineering department. 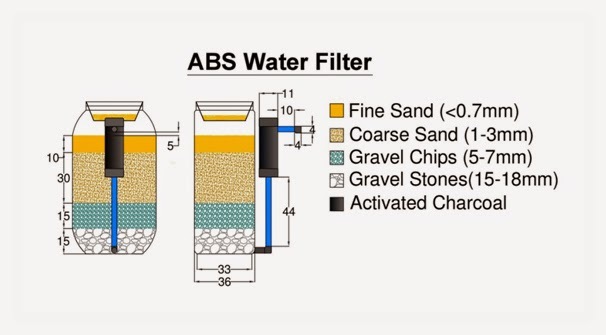 The lack of clean drinking water was the primary motivation for the ABS filter. This filter runs water through fine sand, coarse sand, gravel chips, gravel and activated charcoal in order to purify it. The activated charcoal is a material that can effectively remove contaminants in the water. Maintenance is fairly simple as water that has been purified by the sand and gravel will have to pass through the activated charcoal. Activated charcoal can be regenerated by simply heating it to high temperatures while soaked in distilled water. Testing the water has proved that the filter does in fact remove impurities and brings them within the permissible limit.